Rajahmundry: The water level in the Godavari is rising steadily following incessant rainfall in its catchment area. Water resources authorities are discharging nearly 3.65 lakh cusecs of water into the sea from the Sir Arthur Cotton Barrage at Dowleswaram and the discharge is expected to reach 4.3 lakh cusecs by Friday morning. Officials said the river had nearly 3.79 lakh cusecs of water at present which is likely to go up further if the rainfall continued. Nearly 8,500 cusecs of river water was being lifted from the Pattiseema lift irrigation scheme to be diverted to the Krishna delta. Another 700 cusecs of water was being lifted from the Purushottapatnam lift scheme to supply Yeleru and beyond. A total of 4,000 cusecs was being pumped to the eastern, western and central delta canals and nearly 600 cusecs of water was being lifted from the Pushkara lift scheme. 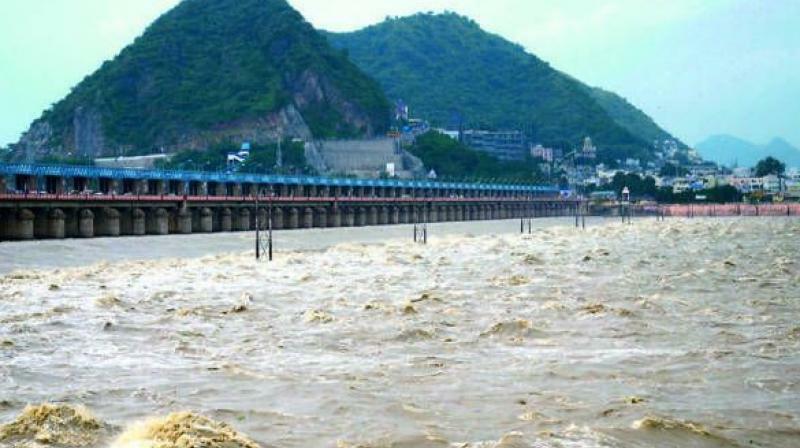 Officials said that once water level touched 11.75 ft at the barrage, all gates would be opened completely to discharge about 10 lakh cusecs of water and the first warning level would be issued. The expected discharge of water is about 4.30 lakh cusecs with all gates partially opened in the next few hours, ruling out any chance of the water level rising alarmingly. Water resources superintending engineer N. Krishna Rao said, “We are closely monitoring the inflows into the river and accordingly releasing water into the sea from the barrage after ensuing water availability for the command area.